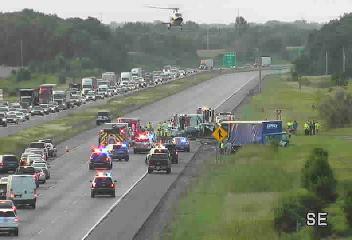 The driver of a delivery truck apparently lost control on Interstate 94 in Maple Grove during the Wednesday morning commute and crossed a median into oncoming traffic, where the truck struck four vehicles, killing one person. The driver of a pickup truck in the eastbound lanes was killed at the scene and a passenger in another vehicle was airlifted to a hospital with serious injuries, the State Patrol said. Authorities shut down the eastbound lanes of I-94 for nearly six hours following the crash, which occurred around 6:30 a.m. near Brockton Lane, as crash investigators tried to figure out how the deadly wreck occurred. Metal and car parts from the five vehicles littered the freeway in a “horrific scene,” said patrol spokeswoman Lt. Tiffani Nielson. Preliminary information indicates thetwo-axle flatbed box-style truck was moving at freeway speeds when it went into the median and vaulted over a cable barrier designed to prevent crossover crashes. The truck driver told troopers that he was alert before the crash and that he had not fallen asleep, Nielson said. The patrol identified the truck driver as John Robert Houdyshell, 53, of St. Louis Park. He was taken to North Memorial Medical Center with noncritical injuries. He was wearing his seat belt. The pickup driver killed in the crash was Kevin Allen Parker, a 40-year-old from Monticello. A passenger in one of the vehicles, Robyn Susann Grebinoski, 38, of Otsego, sustained serious injuries and was airlifted to North Memorial Medical Center, where she was in fair condition, a hospital spokeswoman said. Occupants in the other vehicles were not seriously hurt. A major traffic jam formed behind the crash and extended beyond Hwy. 101 in Rogers. Drivers caught in the queue before the patrol could close the road were allowed to cross through the median and were directed back west toward Rogers. The freeway reopened just after noon. The crash made the morning commute miserable all across the northwest suburbs. Motorists eastbound on I-94 were diverted off the freeway at Hwy. 101 in Rogers and left on their own to find alternate routes. Many opted for Hwy. 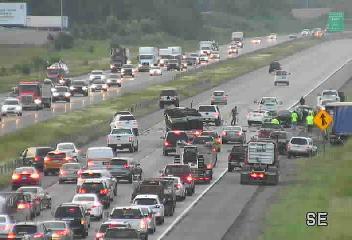 10, a few miles north, which led to traffic jams through Ramsey and Anoka. Cable median barriers have been on Minnesota freeways for 14 years and are credited with a “dramatic reduction in fatal crashes,” said Kevin Gutknecht, spokesman for the Minnesota Department of Transportation. In this case, the truck went over the top of the 30- to 40-inch high barrier, just clipping the top cable. “They are not fail-safe,” Gutknecht said.